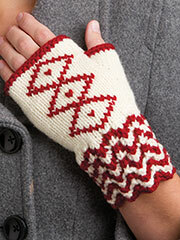 Make embroidered fingerless gloves using American-grown wool. 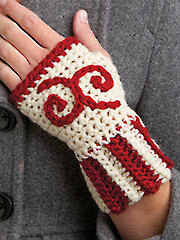 Kristin Nicholas shows you a knitted version, while Ellen Gormley brings you the crocheted pair. 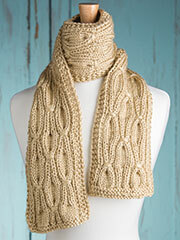 Brett Bara knits the Smocked Rib Scarf. I agree with Amy, perhaps only two patterns per show, and sometime have to dig in. Brett tried to push both the crochet guest and the knitting guest to speed up the segment. That being said, I do enjoy your show. 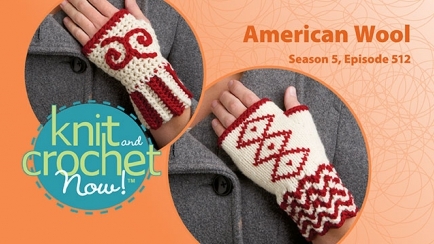 The person who shares the knitting instructions (for instance, for the Embroidered Fingerless Mitts in episode 512) on your Knitting and Crochet sites is very helpful. I think it sounds rude for Brett to tell her "well, we're almost out of time", Can't she find a friendlier way to move her along? Better yet, give her time to teach without all the extraneous stuff you put on your show to fill in the time she could use to do a proper job of teaching. Brett always seems to be rushing the knitting instructions, but gives the crochet instructors more time. It's irritating, and makes me not want to watch.